I could do more for the future of young Americans with this blog post than Obama and Romney combined. The central concept is live a simple life. With secondary regard for whom is or isn’t president, folks need to develop their faith, eat right and exercise, grow their career and minimize lust for material things. Obama is the key—Michelle Obama. The first lady’s personal history is the story of a Chi-town girl who got her homework, focused in class and honored her parents with her actions. As we would say back in the day, I like how she “carried herself.” We spend billions of state, local and federal governmental dollars addressing personal problems that some Americans went out of their way to create. They should have been living the simple life. Last week, a country song came on the truck radio called “Alright” and it was all about enjoying a basic existence. I don’t want to get side tracked about how country music is really blue-eyed blues, and rock and roll is blue-eyed soul which was stolen. Anyway, I searched the net for the song and it is actually by Darius Rucker, the brother who turned to country after fronting the pop/rock group Hottie and the Blowfish. Peace, love and happiness to Brother Rucker and his song is similar to the rural vibe of many tunes in that genre. As quiet as it is kept, my favorite cd of all time is Lynrd Skynyrd greatest hit compilation called “Gold and Platinum.” Rucker’s song feels like Skynyrd’s “Simple Man” and both songs seem to be based on what you tell kids at home and at church. Bottonline: if you live a simple life, you can limit drama, stress and strain. I am proud that President Obama and Governor Romney limited their campaigns because of the storm. To me, the Obama of the first debate didn’t see a need to campaign much more anyway. He did what he wanted to do for the nation and if said nation didn’t like it….peace. He saw no need for a hard sell after giving it his all. At the same time, I don’t think Romney recognizes the “him” that he is presenting in order to win the election. I think he is a moderate who ran as a far Right conservative to win the GOP primary— now, he wouldn’t mine leaning back to the middle to get over the hump. I have a feeling that if giving the choice between (a) being a great disaster president over the next week yet losing the election because he didn’t make a final push or (b) winning the election by keeping one eye on the storm recovery and one eye on the campaign—Obama would quickly pick choice A but maybe being a great disaster president wins the election. Yes, Romney managed the disaster at the Salt Lake City Olympics but that isn’t the same thing. Who really represents you in congress could be a technicality? On my street, a community activist has several “Sanford Bishop for Congress” signs in his yard. I started to tell him that after the last redistricting, we can’t vote for Bishop and he doesn’t represent us anymore. But, the thought occurred to me: “your congressman” isn’t necessarily the one who has your geographic district. For example, ultra-conservatives that live in Rep. Bishop’s 2nd congressional district of Georgia ignore his service because they want a far-right winger in office. For southwest and middle Georgia, Rep. Bishop and conservative Rep. Austin Scott actually listen to more of the opposition than most members of congress. While moderates appreciate Bishop’s listening to everyone, I think the far-right section of the conservative movement only wants GOP representatives and senators to hear from them—because they are the only people who are right. Rep. Bishop still represents my community and that is fine because more people who sleep in my town work in Bishop’s district than work in our technical congressional district. We work, shop, worship, study, eat and chill across that invisible congressional line. Bishop and Scott have parts of Macon, Georgia and Columbus, Georgia, and you can believe that people constantly smudge- out that line in their minds. You might not be able to vote for the congressman or woman from the neighboring district but you can still make that campaign donation. Also, our votes are becoming less impactful anyway. As a moderate Democrat, my voting in the GOP primary was more important to selecting the next president than my coming vote for President Obama in this non-swing state. Yes, I voted in the GOP primary because I wanted to ensure that even if my guy didn’t win, the winner would be the best from the other side. In other words, Romney wasn’t crazy like some in the GOP primary field—just aloof. For the record, I would be undecided at this point if the GOP presidential candidate was Jon Huntsman, Condi Rice or Mitch Daniels. I don’t vote for Bishop and Obama because they look like me. I vote for them because they try to incorporate everyone’s opinions in the decision-making process. To my conservative friends, I say look to Austin Scott when you discover that you can’t be a national party without having a functional relationship with the political center. I should call it like it “t.i.s. tis.” I live in the mega-congressional district Georgia 2nd/8th which is represented by Rep. Bishop and Rep. Scott. Candidate Romney should have listened to the song “Pop Life” by Prince before making his 47% statement last spring. He could have spent two days in south Georgia listening to Rep. Austin Scott and two more days learning from me on the front porch—but more about that later. “What’s the matter with your life…is proverty bringing you down.” Prince is actually a rather conservative music star and his patriotism and logic comes out in his lyrics. In “Pop Life,” Prince sang, “everybody can’t be on top…life, it ain’t real funky unless it’s got that pop.” There it is; that is what I have been waiting to hear from some leader for three decades. America doesn’t guarantee a great life to everyone but (as Newt Gingrich said when he was Speaker of the House) everyone should have the opportunity to learn in a quality school, train as an adult and build wealth overtime through hard work and smart living. Yes, we should have temporary help but don’t plan on life-long government assistance. Everyone can’t be middle class and those who find themselves in a lower-income bracket likely arrived there because of personal decisions, playing in school and simply being out hustled by the real go-getters. I am not a real go-getter and most classmates from 16 years of formal education drove harder for the good life– congrats to them on their success. I know who to blame for my thin wallet—the guy in the mirror. Attending a high school football game today is difficult for me because I am concern with the fact that some of the kids in the crowd are prepping for the state penn rather than Penn State. Their music doesn’t have the substance of Prince or early rappers. My wallet would be crazy fat if conservatives asked me how to create a segment in their movement that would attract the sensible center but they are too busy loving on the angry far-Right. During then congressional candidate Austin Scott’s effort to unseat Blue Dog Dem Jim Marshall, I saw Scott and RNC chair Michael Steele get off a bus together. I knew that the Dems would be in trouble if the Scott, Steele, Jon Huntsman, Indiana Governor Mitch Daniels and similar minds crafted a message high on issues and solutions and low on name calling and fear tactics. That development never happened and President Obama has the lion share of us in the middle. Yeah, my man Prince wrote the daylights out of Pop Life with lines like “..is the Mailman jerking you around…did he put your million dollar check in someone else’s box.” While Prince was talking about the sweepstakes, people in my community put too much hope in the lottery and wishing that their sons will make the NBA. Once and for all, if your son spent as much time and effort in school work as he does bouncing a ball, he could be so rich that he had money offshore like Romney. Plus, most former NBA players are destitute six years after leaving the league. Austin Scott seems like Barack Obama during his first congressional bid. He played the smooth role and stayed fiscal in his concerns about Democrats–avoiding the birther nonsense. Do you think the GOP spent much time studying his blueprint for defeating a moderate Democrat? Nope. Well, I am not one to want anyone to wallow in ignorance. When they get ready to learn how to approach reasonable people reasonably, my flat wallet and I will be right here. Is the mailman jerking u round? Tell me, what’s that underneath your hair? And I’ll show u a boy aware! What u putting in your nose? Golf tournaments in Atlanta and Memphis sometimes have paddles that put me in the mind of campaign strategies. 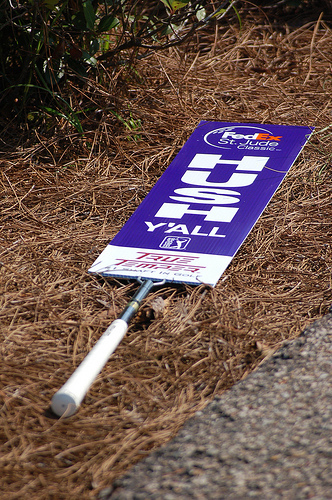 While marshall’s paddles usually say “Quiet Please,” our southern signs state “Hush Ya’ll.” I love it and I think candidate Barack Obama privately told certain supporters that in 2008. If you live by the sword, you die by the sword. Governor Mitt Romney had to stand on the stage with a cast of characters in the GOP primary who push their agenda to the far right and who said outlandish things about non-Republicans. Well, it is hard for Romney/Ryan to secure the political center now when they failed to denounce crazy talk about Obama’s birthplace, “I want MY country back” and those who (they feel) don’t love America. If Obama told the far left “Hush Ya’ll,” Romney likely wishes he could do the same with the most vocal segment of the conservative movement. But, those activists are not hearing it; they want red meat and they want plenty of it. That same red meat will drive folks to the polls—not only to keep Obama in, but also to keep the crazies waiting in the wings out. Again, Romney is a Trojan horse and you know who is inside said horse–the damgum Tea Party. For those just taking notice of the presidential election, the headlines should currently read “Jon Huntsman and President Obama in vigorous yet civic debate on ideas.” See, the GOP selected Governor Romney out of a cast of characters and the least amount of interest went to the former Governor of Utah Jon Huntman, a man President Obama appointed Ambassador to China. Team Obama had the foresight to embrace Huntsman because that sullied him with the conservative movement. Chicago knew that Huntsman was a candidate who could win the political center. Chicago and wherever Romney is based has also decided that the election will be won in a few swing states. Horse feathers! If most of the south is off the table, the state and local organizational structure isn’t active on the Democrat side. To me the Red Team is a small, well organized army with weak generals while the Blue Team is a large, unorganized team with better generals. Despite the wisdom of Fox News and MSNBC, Georgia can be won by the Democrats. The untapped potential for Dems might be motivated the ugliness of the GOP primary–“let’s go to the video tape.” So, people need to stop this “call your cousins in Florida and North Carolina” talk. If the people Democrats care about actually voted, the election would be over. The election might be over if Team Romney doesn’t start producing some plans and ideas. Romney looks like presidential material; while Obama and Huntsman are presidential material. The sweet thing about blogging is that it serves as a record of who wrote what and when it was written. My friends in the conservative movement know that Michael Steele, Jon Huntsman and I have been begging them to create a moderate wing of their team. But, they let the crazy 15% drive their bus…off the cliff.